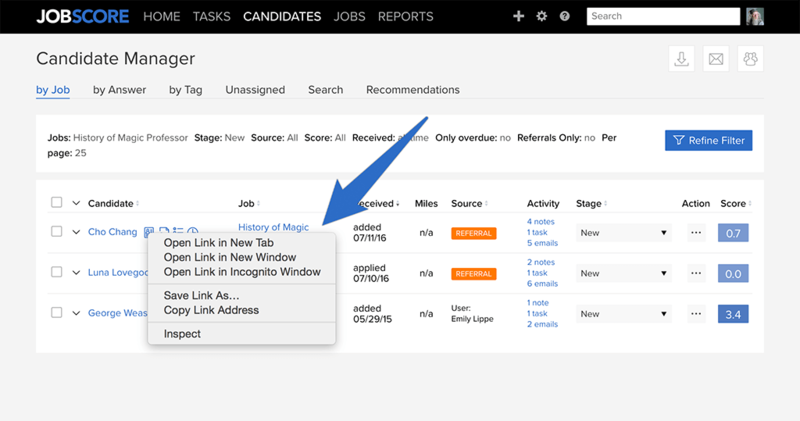 Recently we’ve been looking for ways to improve JobScore by revisiting our core features. The first area we chose to work on was reviewing new candidate resumes. When we started JobScore 10+ years ago we were obsessed with helping recruiters process inbound resumes faster and more accurately. We feel like our combination of resume parsing, standardized profiles, custom questions, scoring and action menus does this well. But some hiring managers kept telling us that no matter how cool our technology was, they still wanted to read the entire formatted resume of every candidate. So we’ve made reviewing complete resumes an awesome experience as well. We hope you have as much fun flipping through resumes we are – and please keep the great feedback and ideas coming.